Series 7 is the latest themed set of fragrances from Comme des Garçons. The series scents tend to be less complex than the "regular" perfumes in the line, and many of them focus on a single note or accord. Burnt Sugar has notes of star anise, cinnamon, orange blossom, spice cake, honey, jasmine, milk, and vanilla. Based on the name and the notes, I was expecting something like a spicy, Asian-food inspired Crème Brulée, but this is something else entirely. I do like the spices in the top notes, but it fades rapidly to a lightly spiced floral with just a slight hint of synthetic milk & sugar. The whole thing is very short lived. Sticky Cake has notes of almond, honey, dates, pistachio, iris, milk, brown sugar, ambrette seeds, cereal notes, and myrrh. This is a very sweet, powdery iris fragrance, with some doughy & nutty undertones. It is kind of an odd scent, and doesn’t smell like any sticky cake I am familiar with, but I don’t dislike it. It is probably too sweet for me, and I doubt I like it anywhere near the price, but it is at least worth another try, and alone among the 4 listed here, it has good lasting power. Spicy Cocoa has notes of bergamot, grapefruit, chocolate, cardamom, fennel, coriander, black pepper, chilli, and cocoa. I rather liked this for the first 5 minutes. It smells like Mexican hot chocolate, spicy and slightly bitter, with a nice dose of fresh orange on the side. After that, it started to smell faintly synthetic, and after 15 minutes it was too faint and nondescript to have an opinion about it either way. Wood Coffee has notes of cardamom, liquorice, ginger, almond, coffee, wood, patchouli, and vanilla. It starts with a heavy, heady mix of spices, patchouli and coffee, and calms to an earthy, woody, lightly sweet patchouli with a touch of coffee. The spices are very subdued once it settles, and I cannot smell almond at all. As I generally detest patchouli in any significant concentration, I will disqualify myself from commenting further, other than to add that the lasting power leaves something to be desired. 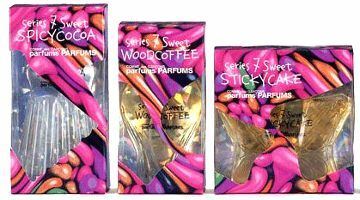 The Comme des Garçons Sweet series fragrances are available in 50 ml. At $80 each, these are considerably more expensive than the other Comme des Garçons series, and it is hard to see what justifies the price. Personally I found the leaves, red and incense series far more interesting (I have not yet tried the sherbet). I would love to hear comments on Nomad Tea, which I have not yet tried. Nomad Tea was the best of the line, and even then it wasn't that interesting. I'm not a foodie scent fan, and the thought of walking around smelling like a Gloria Jean's (mall coffee shop, for all the New Yorkers who have no idea what I'm talking about) is putrid to me. That said, Karen (liongirl) and I had a funny moment when she was testing Burnt Sugar. She was going on about cookies and such, and she offered me her wrist, and immediately something struck me as way odd. “It's something synthetic…plastic…rubber…LATEX. It's latex.” She smelled it and sure enough, there was the huge odor of latex rubber underneath the smell of cooking sugar. She started cracking up eventually, howling, “A condom with sugar on top!” for the next few minutes or so, until the effect faded. But it was there, all right, a massive note of latex rubber hidden in the cookie. Those CdG perfumers, they're pervs. Condoms! I was thinking Burnt Sugar reminded me of my son's scratch 'n sniff dessert stickers, but condoms is way more amusing. V, who makes Black Gardenia? My most serious burnt rubber experience is still Pilar & Lucy Exact Friction, which mysteriously smells good on everyone else, apparently. Hi R! I am surprised to like anything labeled “Sweet”, but Nomad Tea will be a full bottle purchase for me. It starts out very bright green and minty, but dries down really quickly to a smoked wood and tea scent. To me the drydown is very similar to that of Gobin Daude Nuit Au Desert, that really dry smoky herby smell. I am seeing a lot of leg of lamb and watered down Lipton comments, so it seems that CdG Series 7 is even more chemistry-fickle than usual. I'll be curious to see what you think of Nomad Tea! K, Smoked wood & tea sounds great, and Nuit au Desert is beautifully done. But leg of lamb: maybe not! Ok, going to have to get my hands on this one and try it out. Hello R! I have not found anything in CDG that i have ever wanted to buy. The boutique in Paris is lovely though. Thanks for the description. Have a super weekend. I liked Spicy Cocoa best of the series, but not enought to buy. I don't remember what Nomad Tea was like, but it was low on the list. N, I keep meaning to get to the CdG store in Chelsea (NY), I hear it is very cool. I always need yet another trip to NY. You have a great weekend too! V, If Spicy Cocoa had lasted just a bit longer, I would have been more impressed, but even then, $80 is too much for a “fun” scent. I wonder if these do better sprayed though? It's actually Black Gardenia who makes Gardenia Oil and Tuberose Oil. Other than that, I'm not sure who “Black Gardenia” really is, but a 1/2 ounce bottle is $95. I ordered a Gardenia sample from Luckyscent a few months ago. I may have swapped it away already, but I will take a look in my sample stash and let you know. Thanks V, I have never even heard of the line. Will check out luckyscent! I checked out the Sweet series in Chelsea, a really wonderful store with appropriate ambience to the experience these fragrances. Anyway, I like gourmand scents, and was most impressed by Spicy Cocoa. The aromatic spices used are nice and better than if they highlighted cinnamon. For the first 15 minutes, I was absolutely thrilled with this fragrance, and was going to buy it immediately. Good thing I didn't. It was gone 15 minutes later. Next time, I TRIPLED the dosage. But it still doesn't last a whole lot longer. I also enjoyed Wood Coffee. I don't own any CDGs, but want to re-test Kyoto, Quarzazate, Palisander, and Sequoia. Maybe I will a CDG to experience over time. Thanks John, I have heard the Chelsea store is really worth a visit, and I hope to do that next time I'm in NY. And good to know that Spicy Cocoa doesn't last even if you pour it on! The only CdG I own so far is Calamus, but I do like several of the others. Burnt Sugar smells like “gum” to me too:-) It takes ages to dry down to a sweet (hot:-) milk, with ginger and cardamom (not that it might have ginger and cardamon, tho) , and then it is intoxicating. Actually I like Wood Coffee and Sticky Cake the most of the series. Sounds like you had better luck with the Sweet Series than I did — Burnt Sugar doesn't last ages on me in any case, and it never got intoxicating. Hot milk with ginger & cardamom sounds lovely! I wish I had such luck! I agree! I realize everyone's chemistry is different but this perfume smelled way off on me. You know, I tried it very quickly on a test strip, but never on skin. Sounds like I need to revisit. Does it last? One of my objections to all of this series is that they seemed as a whole to expend whatever interest they had in the top notes, and to get fairly dull once they dried down. Just over one hour later, it's still hanging in there nicely. (Faded a bit, but nowhere near as non-existent as so many Series scents would be by this point.) You say that this series is prone to fading, but to me (and according to the posts of others) this also seems true of many of the other Series lines too (particularly Green, Sherbert, and Incense, in my experience). I have not found this to be the case with the “mainline” CdG products (2, especially, seems very unstoppable). I wonder why they couldn't have formulated the Series lines to last longer? It's sad. It is true that it is senseless to expect massive complexity or lasting power from the series scents — that isn't what they're about. The Sweet series just didn't capture my attention. I don't think they've ever bested the incense series, and even the Leaves & Red series somehow had more character & personality than the Sweet, at least to me. But will definitely look for the Nomad Tea next I'm in Barneys! Nomad Tea was the sample I tried this morning, so I thought I'd throw my 2 cents in. I'm have a tea drinking addiction and I love the idea of tea perfumes, although I've been generally disappointed by 'green tea' scents. I digress. I live in the south and sweet iced tea is always, always in the fridge here. Nomad tea smells exactly like my kitchen when I make tea! My method of iced tea is to put a small saucepan of water to boil, add sugar while it's boiling until dissolved, remove from heat and add tea bags to steep, then pour into cold water. I almost always spill a couple grains of sugar onto the burner – the smell of burnt sugar followed by the tea steeping really has been bottled perfectly here. It's almost overwhelmingly sweet for a couple minutes, but it mellows so nicely. I think I'll try layering it with bergamonte tomorrow to give it some staying power. I think (like you've said before) the actual spray instead of the splash sample would last longer. Thanks for the detailed review, you make it sound interesting. I did give it a very quick sniff at Barneys some time ago, as I said above, but still haven't had the chance to try on skin. I don't go to NY as often as I used to — but will manage it eventually! PLEASE anyone knows where I can purchase a bottle of Nomad Tea on the internet? I wanted a full bottle, I know perfumedcourt has decants but I was hoping for that “garlic-bulb” with that beautiful fragrance in it. I know from the Scented Salamander blog that it has not been discontinued as it is still sold in select boutiques however right now I am unable to fly anywhere just to buy a bottle of perfume:)) Nowsmellthis! I know You have a lot of knowledge and You are our Perfume Guru, maybe You know where I can get it? I would not swear to it, but it looks to me like they're no longer exporting the sweet series to the US. If you are willing to make a phone call to NYC, you could call the CdG boutique in Chelsea & see if they've got a bottle they would ship to you, otherwise, all I can think of is to have it shipped from the Dover Street Market in London. I guess it's also possible that Barneys in NYC has a bottle though — their website is never complete. So you could call them too. Sorry I'm not more help, some guru! I just won a FULL bottle of Nomad Tea on Ebay! I'm so happy! I also won a bottle of Wood Coffee as well:)) O used to bid on Nomad Tea before but the seller always cancelled the auction before it's end even when the bids are high… well I just wanted to share my happy news because I have never been forced to look for something the way I had to look for Nomad Tea. But when something is harder to get, You appreciate it even more. are eau de toilette or parfum ? and where are they sold ? I am sorry I do not know the concentration. Click on the link for Comme des Garcons (in first sentence of article) for list of stores, but not sure they still make these.